A new billboard in downtown Mason City features a photo of President Obama, flanked by pictures of German dictator Adolf Hitler and Communist leader Vladimir Lenin. It’s the same spot where a billboard last fall featured the phrase “Obama-Nation, Live Free or Die” with the Communist symbol of a hammer and sickle. The billboards were paid for by the North Iowa Tea Party. John White, state coordinator of the Iowa Tea Party movement, says the new billboard crosses a dangerous line. He says it’s going somewhere the Tea Party doesn’t need to go. White says this type of mudslinging is something they’d like to see stopped in their policies and campaign process. 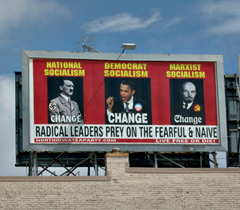 The sign features the words “Democratic Socialism” over Obama’s picture, over Hitler’s photo is “National Socialism” and over Lenin’s head is “Marxist Socialism.” The words “Change” are also included on each photo. White says hand-held signs like the billboard have been discouraged from Tea Party functions. He says he’s seen different signs that have compared Obama to Hitler, or pictures of Obama with a Hitler-style mustache drawn on it, and they’ve asked people put the signs away because they’re “distasteful.” He says people are tired of slander and mudslinging and the Tea Party doesn’t need to take part in it. While he doesn’t agree with posting the billboard, White says he agrees that Obama has followed several of the same principles as Hitler. He says everything Obama has done is “lock-step” with what Hitler did in his day, but the sign goes into an area where the Tea Party doesn’t want to be. The founder of the North Iowa Tea Party group, Bob Johnson of Mason City, declined to comment for this story. The billboard is located at the southern junction of U.S. Highway 65 and State Highway 122.